PT Surveyor Indonesia (Persero) - PTSI is a well-established Government-owned corporation (BUMN) in Indonesia, based in Jakarta and running business in independent assurance services. The Company engaged in survey, assessment, appraisal, inspection, auditing, monitoring and also consulting services. 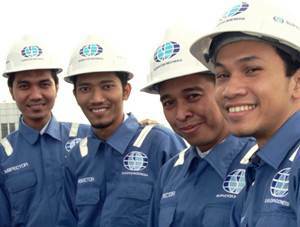 PT Surveyor Indonesia (Persero) is majority owned by the Government of Republic of Indonesia. Currently, PTSI is 85.21% owned bythe Government of Republic of Indonesia, 10.40% by Societe Generale de Surveillance SA, and 4.48% remaining shares by PT SUCOFINDO (Persero). PT Surveyor Indonesia (Persero) runs its business through 4 business units, namely Oil, gas and energy, Government, agriculture and fishery services, Coal and mineral services, and Industry and facility services. As of December 2014, PTSI has 5 branch offices, 4 madya branch offices and 3 pratama branch offices spread across Indonesia. PTSI also supported by 2 key subsidiary companies, namely PT Surveyor Carbon Consulting International and PT Synerga Tata International. In term of financial performance, PT Surveyor Indonesia (Persero) booked an increase in its operational performance in 2015. According to PT Surveyor Indonesia (Persero) Annual Report 2014 as cited by JobsCDC.com, PT Surveyor Indonesia (Persero) recorded its total revenue of Rp 800,774 million in 2014, This total revenue reflected an increase of 5.04% from Rp 762,299 million in 2013. Referring to its annual report, total comprehensive income for the year reached Rp 108,961 million, an increase of 4.98% from Rp 103,790 million in 2013. Background in D3 Secretary with GPA min. 3.00 within 4.00 scales. The candidate with prior experience minimum of 1 year in the field of Secretary is preferred. Honest and have high work motivation. Domicile in Surabaya and its surrounding area. Background in S1 Chemical Engineering/Environmental Engineering with GPA min. 3.00 within 4.00 scales. The candidate with prior experience minimum of 2 years as Laboratory Staff or Laboratory Coordinator is preferred. JobsCDC.com now available on android device. Download now on Google Play here. Please be aware of recruitment fraud. The entire stage of this selection process is free of charge. PT Surveyor Indonesia (Persero) - D3, S1 Staff, Coordinator PTSI December 2016 will never ask for fees or upfront payments for any purposes during the recruitment process such as transportation and accommodation.